The fan experience took a turn Christmas Eve in 2016 when Derek Carr suffered a fractured fibula. The franchise since has compiled a 7-15 record, filed for relocation, overhauled its coaching staff and traded two key players. ALAMEDA, Calif. — It was all wrong. What he heard in the rumor mill. This darn cold he caught Monday. Even this sketch he drew in 2015 — he was one year into the colored-pencil medium, so his skills were less advanced than today. But Mandeep Bajwa called in sick from work, grabbed the framed drawing and drove to Raiders headquarters. He needed to do this. 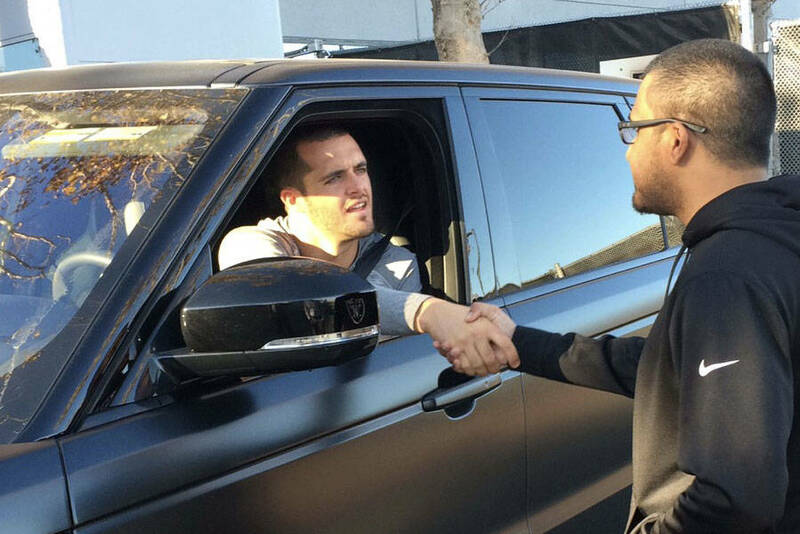 He needed to meet quarterback Derek Carr. 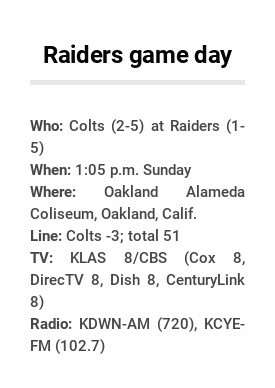 On Sunday, more than 50,000 Raiders fans are due to assemble at Oakland-Alameda County Coliseum for a game against the Indianapolis Colts. It will be their first such gathering in almost a month. The time between has seen an 0-2 record, the latest trade of a fan favorite, reports of locker-room strife and a growing Bay Area belief that there will be little success to celebrate before the franchise relocates to Las Vegas in 2020. The stadium atmosphere will be of note. Even the most ardent fans acknowledge the toll since a 12-4 campaign in 2016. Marvin Bosma, a Reno resident, said he’s a lifelong Raiders fan; his family is from Hayward, California. He wears face paint and shoulder pads beneath a jersey to games he attends. Sunday’s will be his seventh. The fan experience took a turn Christmas Eve in 2016 when Carr suffered a fractured fibula against these same Colts in this same stadium. The franchise since has compiled a 7-15 record, filed for relocation amid decades of stadium uncertainty, overhauled its coaching staff and divorced two players once heralded as part of a promising core. In 2016, defensive end Khalil Mack was the AP Defensive Player of the Year. He was traded last month. Wide receiver Amari Cooper set career highs with 83 receptions and 1,153 yards. He was traded Monday. Their jerseys are now priced 50 percent off at Raider Image, the franchise’s retail store. The overall vibe in the Bay Area, too, feels a little cheapened with a 1-5 record. Yet, resilience and loyalty remain among many Raiders followers. Those attributes are at the fan base’s foundation. Carr said Wednesday that he anticipates the Coliseum to feel no different Sunday than it has in the past. The Raiders won 45-42 in overtime against the Cleveland Browns in the last game there on Sept. 30. Some fans booed and left late in regulation when hope seemed lost after a fourth-down incompletion on a pass intended for Cooper. Those who stayed were rewarded. A day later, Carr was reminded of that loyalty. Bajwa, 30, arrived at headquarters about 11 a.m. Thursday. It was now past 4 p.m. All he largely had done in this span, aside from grabbing pizza during a quick lunch break, was stand and wait for Carr. It had been a wild week for the quarterback. He lost his wide receiver. He was the subject of an article that painted an unflattering picture of how he’s viewed within the organization, anonymous team sources describing a “fractured relationship” between him and teammates. There was chatter, although no evidence it will culminate, that he could be traded. And so, Bajwa wanted to give him a gift. At 4:48 p.m., Carr exited the private parking lot. He stopped his vehicle for Bajwa, rolled down his window and shook the fan’s hand. Bajwa proceeded to say all he planned to say, telling Carr he is the future of the Raiders. He told him that he’s a good person. He told him to ignore the negativity and that he’ll always be behind him. 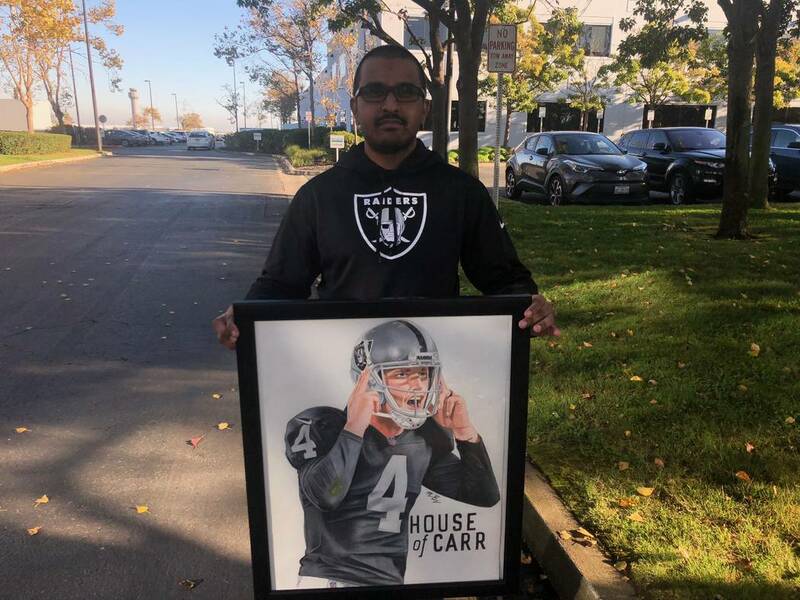 He gave Carr the portrait. Their conversation lasted a couple of minutes.